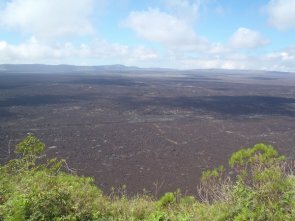 Sierra Negra is the second largest active caldera in the world, the first being Yellowstone. This photo was taken standing on the lip of the crater looking out over the lava field. There is no vegetation because the lava was renewed just ten years ago at the last eruption, where a new crater formed on the north side and the lava flowed out from that across the plain. To give you an idea of the size of this volcano, you can just see the crater wall in the distance, which is about ten miles away. 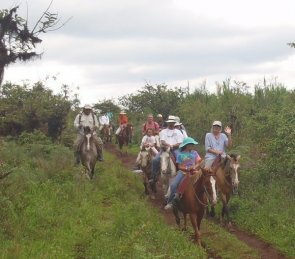 The volcano was a 45 minute trip on horseback. Here is Andrea looking very collected on her horse, waving to the camera. It was a fun ride, they horses were quite frisky and trained for neck reining, which is not something I have tried before.